The Academy of Oncology Nurse & Patient Navigators had a strong presence at the first of the Biden Cancer Initiative’s “Conversation with Dr Biden,” on March 10, 2018. These conversations provide members of the patient support network with the opportunity to share their perspectives on the cancer journey. 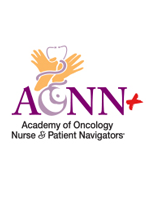 More than 1000 oncology nurse and patient navigators from across the United States and Canada gathered in Las Vegas for the Academy of Oncology Nurse & Patient Navigators (AONN+) Seventh Annual Navigation & Survivorship Conference. “As a CoC member, we look forward to joining forces with some of the nation’s foremost oncology organizations to help write and implement policy that ensures patients have access to the highest standard of care available for their cancer,” said Lillie Shockney, AONN+ program director. SAN ANTONIO—In conjunction with the Second Annual Navigation and Survivorship Conference, the Academy of Oncology Nurse Navigators (AONN) presented the Second Annual Excellence in Navigation and Survivorship Awards. Recognizing excellence in patient navigation and survivorship care, 5 recipients were selected from more than 60 nominations in a variety of categories.